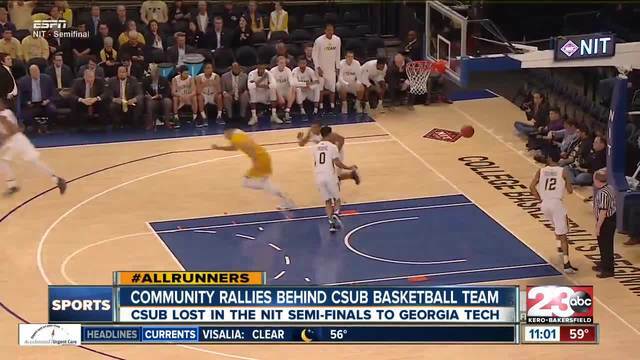 UPDATE (March 28, 2017 6 p.m.): CSUB lost the NIT semifinals game against Georgia Tech 76-61 Tuesday night in New York. The Cal State Bakersfield men's basketball team is set for an historic game in Madison Square Garden Tuesday night. The Roadrunners will be taking on Georgia Tech in the NIT semifinals in New York City. It's the first time in CSUB's history it's made it this deep in the postseason and it's the first time a No. 8 seed has advanced to the semis of the NIT. Coverage of the game begins at 4 p.m. on ESPN. If CSUB wins tonight’s game they will play in the NIT finals against either University of Central Florida or Texas Christian University. Cal State Bakersfield won games against No. 1 California, No. 4 Colorado State and No. 6 UT Arlington in the previous tournament games.